Is cortisol messing with your life?? Have you had your cortisol levels checked? It may be time to do so. Talk to your doctor or chat to us at New Leaf about ways your cortisol can be checked! High cortisol levels in your blood can contribute to skin issues like thinning or easily bruising skin and stretch marks that are pink or purple in colour on the arms, buttocks, legs, stomach or breasts. On the flip side, abnormally low levels of cortisol may cause patches of increased pigmentation (hyper-pigmentation) on your knees or elbows. And remember — we live in a world of electronic devices full of EMFs (Electromagnetic Frequencies) and bombardment of blue light. Using ear plugs to get rid of white noise, silencing your phone and turning off your computer a couple of hours before going to bed is helpful to ensure quality sleep. This practice will make a huge difference in controlling your brains internal clock that tells you when to sleep. It is important to remember that timing, length and quality of sleep all influence cortisol for better or for worse. Studies show that exercise can help to reduce cortisol levels. However, the opposite can be true if you over exercise or exercise late at night. Doing intense exercise earlier in the day increases cortisol levels immediately following exercise but it can have positive effects of reducing cortisol levels in the evening and before bedtime. Deep breathing helps to lower stress and is an easy habit anyone can do anywhere. Studies show that this simple technique can help to substantially lower cortisol levels. Who would have guessed? Read my article on how to effectively practice deep breathing for relaxation. Other helpful techniques that incorporate deep breathing for relaxation are yoga and tai chi. Check out this helpful guide on adding other relaxation techniques such as meditation, visualisation, music and progressive muscle relaxation. A great cup of coffee or tea can be a sure way to get some energy and also some pleasure in life. But both, along with chocolate, can keep you up at night. Caffeine can affect your cortisol levels and disrupt sleep patterns so be mindful of when you have it. I have also noted that many of my patients report that they slept better and felt better all-around when they limited their alcohol consumption, especially in the evening. Chronic inflammation is a huge trigger of cortisol imbalances along with blood sugar balance. Simply put — a diet of processed foods, poor-quality fats, and too much sugar can cause inflammation that leads to chronically over activated cortisol production. When was the last time you found time to do something that really made you happy? Pursuing things that bring you happiness and satisfaction can help to lower your cortisol levels. Hobbies such as art, music, gardening and spending time outdoors can provide a sense of well being and pleasure which will help keep cortisol down. It’s time to develop those hobbies you’ve been dreaming about! Having strong relationships with family and friends can help you to manage stress and lower your cortisol levels. However, at times, these relationships can be the cause of your stress. Learning to deal with conflicts and seeking positive outcomes will provide stronger bonds and emotional well being. Having more friends and family in your life can be a source of great happiness and support. Even furry companions such as canine pets can prove to be helpful in lowering cortisol levels. Studies show that taking certain supplements can help to manage cortisol levels and stress. Supplements such as fish oil and other adaptogenic herbs like ashwagandha, Rhodiola, Cordyceps, and Reishi have been shown to lower cortisol levels within 60 days. Below are some of my favourite supplements for restoring cortisol levels. 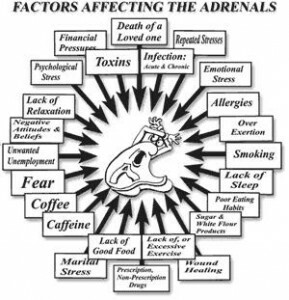 All of our processes can support reducing your stress, and rebooting your adrenal glands. One of my favourites is Omega Brain Care, a Phosphatidylserine and essential fatty acid supplement that has been found to naturally block the harmful effects of cortisol. The body produces very little of it, so supplementation can ensure you are getting enough to maintain overall good health. I also like to suggest Adrenotone which is a combination of standardised adaptogen herbs and nutrients designed to help support healthy cortisol levels as well as protect you against chronic stress. Ready to get your cortisol in balance but feel unsure about where to start? Testing is usually the first step and I can help with that (Doctor’s test, nutripath testing through us, kinesiology). A simple cortisol saliva test is one way to get an accurate reading of your cortisol levels and way to monitor your progress over time. Then we can discuss some great protocols that can help you achieve balance – naturally. You are currently browsing the New Leaf Blog blog archives for September, 2018.